Skull Appreciation Day is almost here! 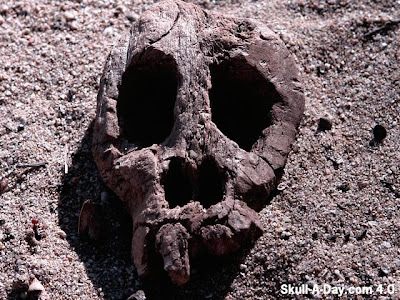 Just a reminder that the 1st annual, international Skull Appreciation Day is this Saturday, June 4th! I hope you'll do something nice to celebrate your head bone. If you do, we'd love to know what you ended up doing, so please share the details and we'll post about it here! 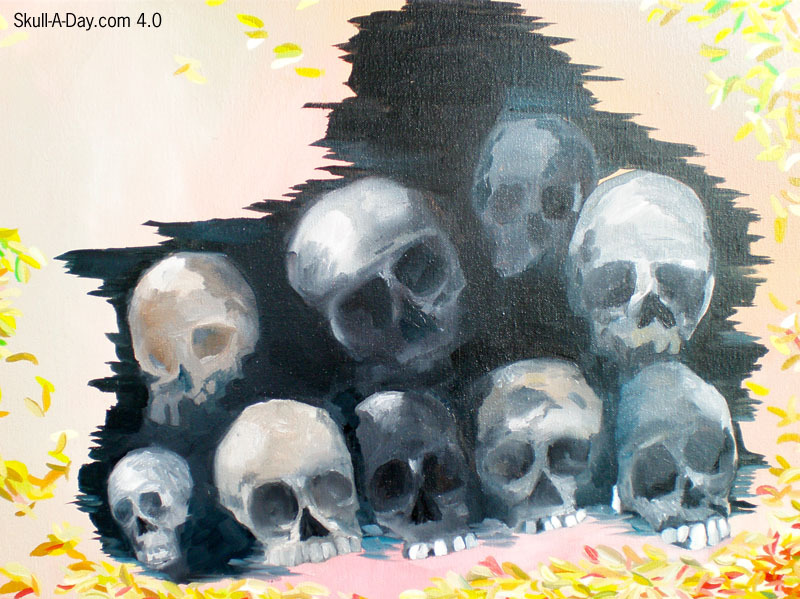 100+ artists share their interpretation of the skull. 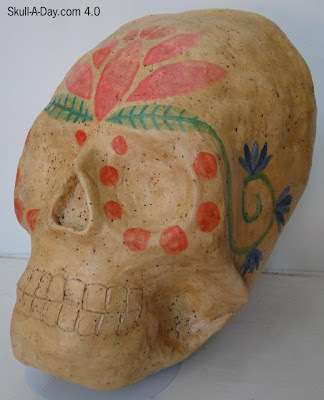 Using a plain papier-mâché skull provided by the curators, over 100 local, national, and international artists are sharing their own personal take on this universal symbol. A portion of all sales will be donated to the local nonviolence organization Richmond Peace Education Center. These quilts will be auctioned off and all proceeds will be donated to DC charity Becky’s Fund, which helps survivors of domestic violence. 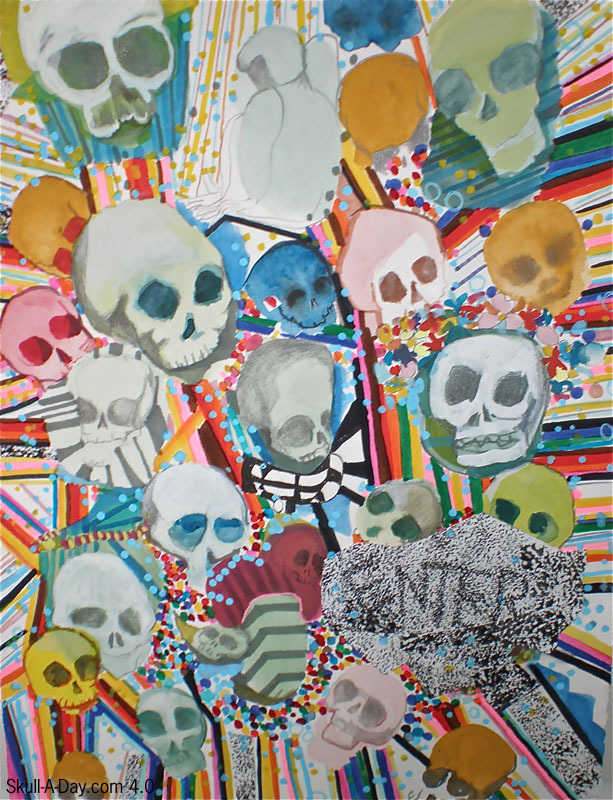 Artist Mim Golub put out the call for mail artists across the globe to create and send skulls through the post to celebrate Skull Appreciation Day. You can also see the submissions online HERE. Bring the family and celebrate the love for the bone in your head by spending the afternoon making skull-themed crafts! Materials and directions provided. Our friends from local nonprofit Art180 will be on hand to help you get motivated. 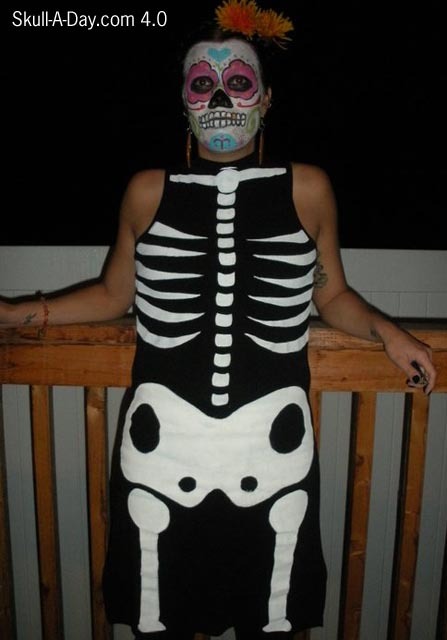 Wear you favorite skeletal costume or skeleton mask and celebrate your cranium in style. DJs, drummers, and special guest performers, including Deepa de Jour & All Saints Theater Company, will get your bones shaking. 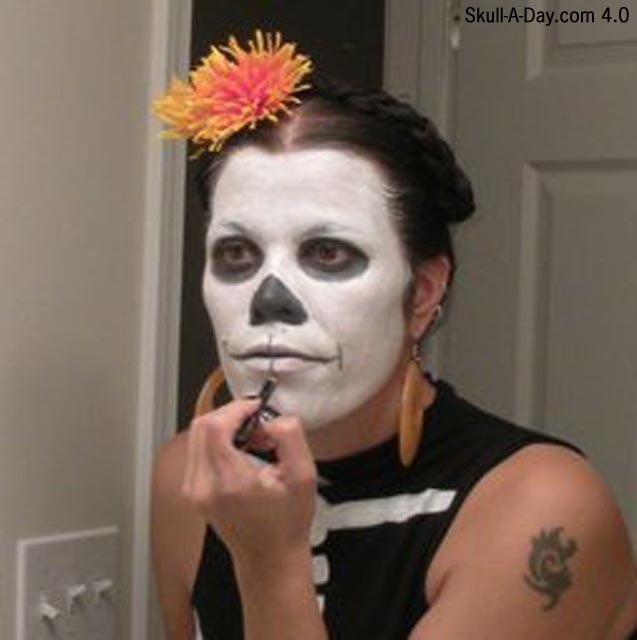 There will also be a best costume & make-up contest with special prizes from Skull-A-Day. p.s. If you like the image above you can buy it as a limited edition poster in the Skull-A-Day store HERE. This delicious looking pint was drawn by Jim Carney, a bartender at G-Daddy's BBC in Milwaukee,WI. 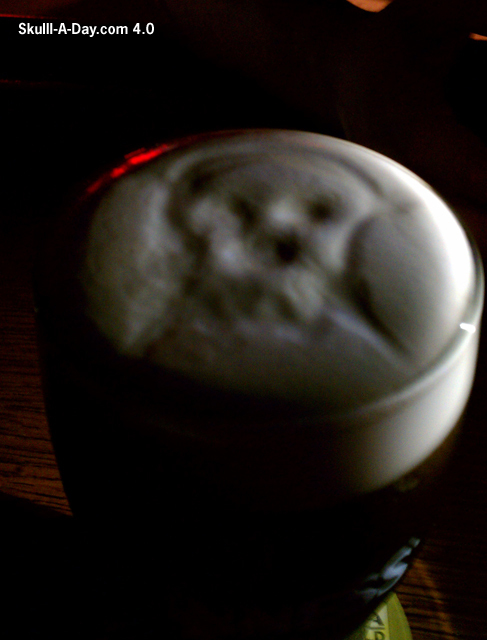 He writes, "I love skulls and get a little bored of drawing clovers on my Stouts. Thank you for having a blog dedicated to skulls. I feel like the kid that said, 'I like turtles'." "May the road rise up to meet you, may the wind be ever at your back. May the sun shine warm upon your skull and the rain fall softly on your fields. 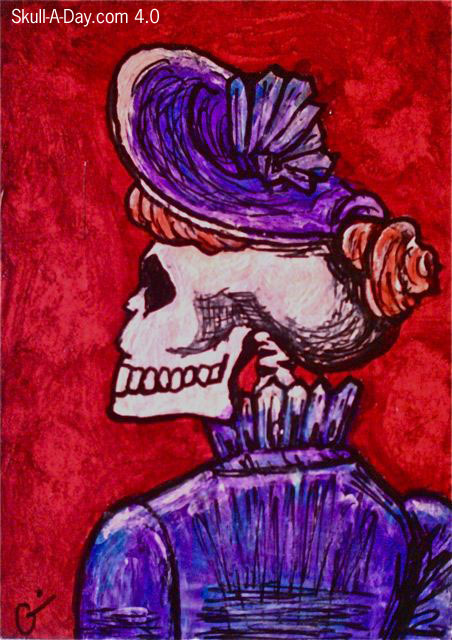 And until we meet again, may Skull-A-Day be your favorite blog to share." To be entered in the drawing just leave a comment below stating: Whose skull would you toast? I'd toast Keith Richards's skull. Wait...is he still alive??? Today's submitters were various skeletons for Halloween, in different years. 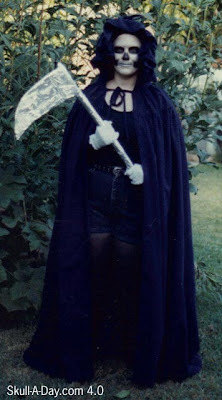 Greta Block from Irving, TX explains, " I was the Grim Reaper for Halloween in 1993. I won second prize in a costume contest." 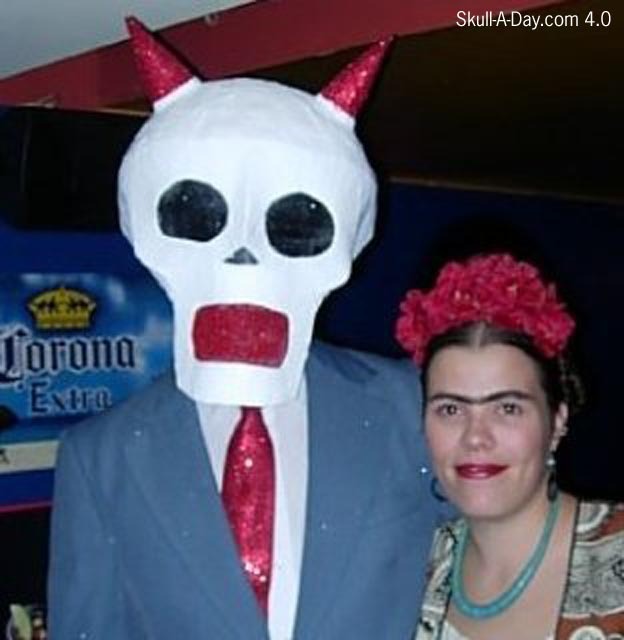 Erica says, "My friend and I both did a Mexican art theme one year for Halloween. I was Frida Kahlo and he made an excellent paper mache skull head. The horns and mouth were even sequined. 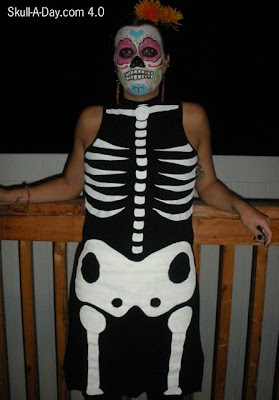 Last year, I painted my dress and face to be a sugar skull/skeleton. One photo is a progress shot and the other is the finished product." I always love seeing these type of costumes. While I don't find them scary, skulls and skeletons are a popular fright at Halloween. In our world, we of course deal with them daily. Weather we are frightened by those in skeleton costume or not, is irrelevant. 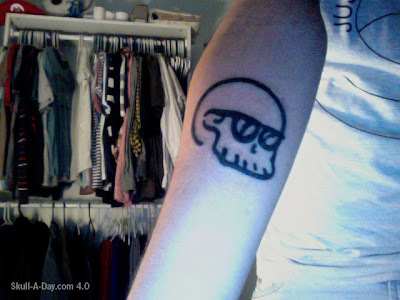 It's very interesting to see each personal interpretation of a skull on their skin or as a mask. To be entered in today's drawing to win a button just leave a comment below stating: What kind of skull do you have under your skin? IMPORTANT: Don't forget to include your EMAIL ADDRESS, so we can contact you if you win. For this last week's round of simulacra for the 4.0 year I decided to post a few images that should be a staunch reminder that hidden skulls are underfoot at all times. 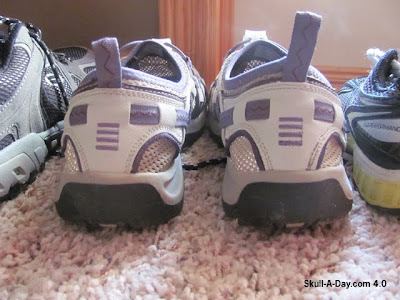 My wife Kendra sports these nifty little skulls on the back of her shoes. 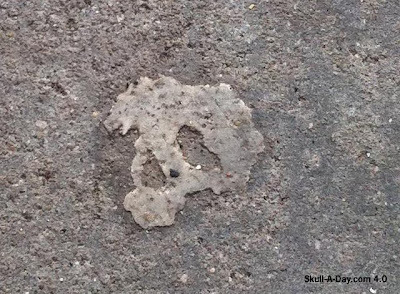 Joel Gration found this interesting "Chewing gum on the flo'". 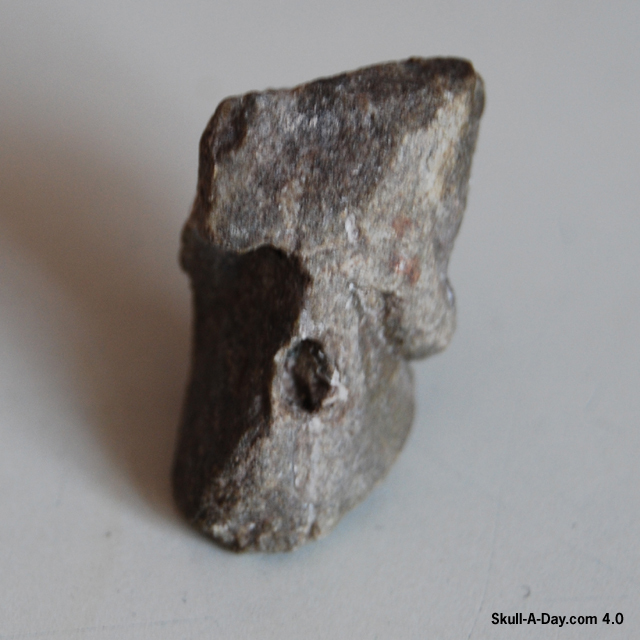 And near a construction site in Zurich, Switzerland Toby Melunsky dicovered this skull pebble. Never let your eyes grow weary, skull hunters. Make it your objective to capture those hidden skulls before they GET YOU!!! Thanks again to everyone who contributed all of the great simulacra images this year. Sundays have been a tradition for these posts, and we hope you'll all continue to help us make this happen. LONG LIVE THE SKULL HUNTERS! To be entered in the drawing just leave a comment below stating: What you would name a line of skull shoes. Any style you like. I'd have a pair of flip flops with eye sockets on the straps and your toes would be the teeth. I'd call them Skeets(skull feet). 365er M.L. Rey Mehlhorn sends us a comedic cartoon about a couple of skulls trying to work out their afterlives together. Rey writes "Somewhere in some twisted afterlife, this is Hamlet apologizing to Ophelia. Trying to. 'Sorry I killed your father, told you to shove off, and generally drove you insane. Have some dead flowers?' I think she's had enough of the flowers." Oh snap! Ophelia is all, "Talk to the phalanges and the metacarpal cuz the ossicles ain't having that!" This is a great bit of sophisticated skull humor, which is always a treat. Thanks, Rey, for sharing this episode of "Behind The Shakespeare". To be entered in the drawing just leave a comment below stating: What other literary skulls might deserve an apology. “Skulls one of the hardest things on earth but you still can't cook on it.” I truly enjoy the balance of fragility with this piece. The bright lighting on the egg instantly draws one there and as you slowly pull away do you see the graveness of the situation. Thank you for submitting your work for us to share. To be entered in the drawing just leave a comment below stating: What would your skull like for breakfast? Not only is this my favorite skull of the 1.0 year, but it's also one of my favorite skulls of all time. 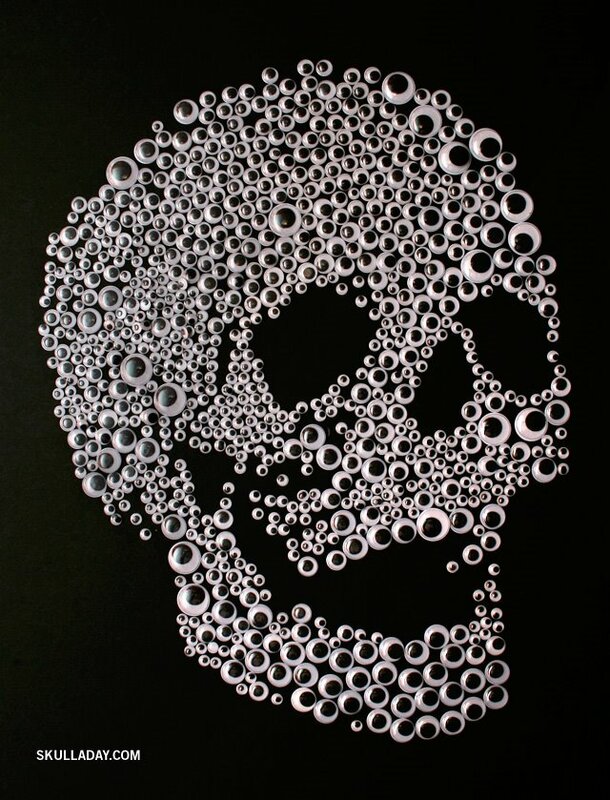 The most noticeable trait of just about every skull you see is the lack of eyes. Making a skull out of nothing but eyes is just as hilarious to me as it is ingenious. The addition of the actual eyes steps the laugh factor up a notch. The only thing better than this would be to see all of the eyes moving around together, which I might get to see personally next weekend in Richmond at the Skull Appreciation Day event. One week to go and I can't wait to see everyone who makes it. Dia de la Abby #52 - Skull Sculpture. This is my final piece for the 4.0 year. It's hard to believe, it's been a year already. This sculpture inspired by Nazca and Mayan skulls. 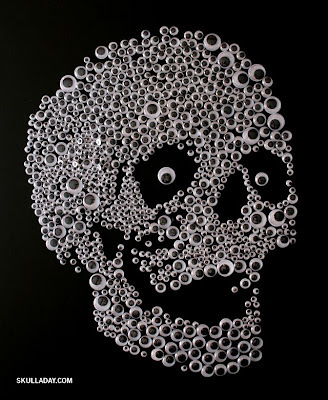 I made this sculpture for the Skull exhibition of our Skull Appreciation Day festivities. It will be shown at Gallery 5 from June 3rd till July 8th. It will be available for purchase through the Gallery. This piece combines my love of ancient skull with some skills I picked up while making other pieces for the 4.0 year. I made this starting with a fairly plain commercially made paper mache skull. I built up the back of the skull using newspaper. I covered the entire skull in several layers of plaster cloth, to make it stable and hard. After that cured for a week (I worked on quilts during that time), I covered it with paper clay. This took the longest, as I was attempting to smooth out the plaster lumps and add definition to the face. The paper mache skull's face lacked a lot of definition, so this was greatly needed. After that dried over night, I dumped a bag of tea into a small amount of warm water and brushed on the tea, to create an aged effect. Since the tea leaves were loose, this created spots on the skull that discolored it more. I brushed most of it off, but when some pieces wouldn't come off, I decided to leave them, so they added to the aged appearance by resembling dirt. Also, since the paper clay cracked in various areas on the skull, I shoved tea leaves into the cracks, to antique them more, as if they naturally occurred from being buried for centuries. I painted several layers of tea stain on the skull. I used water color paints to create the floral design. I sealed the entire skull with 2 layers of an acrylic matte sealer, so it would protect the color and harden the paper more. The 4.0 might be over for me, but don't fret. I will be making more things during the 5.0 year, but likely a monthly instead of weekly. Every week in the 4.0 year, I posted my own Dia de la Abby posts as well as a tutorial with instructions on how I made my piece. Hopefully you feel inspired by my posts just as I was by Noah's Skull-A-Day 1.0 daily project. Need more of me than just a weekly dose, follow me on Twitter and/or Facebook. Anita Foard submitted these piece of skull artwork. By the look of the shading and opaqueness, I think these are done with water colors. I like the use of vivid colors and grays to create these skull paintings. It speaks of the light and dark in all of us. They are all beautiful, in their own way. My favorite is definitely the 1st one. 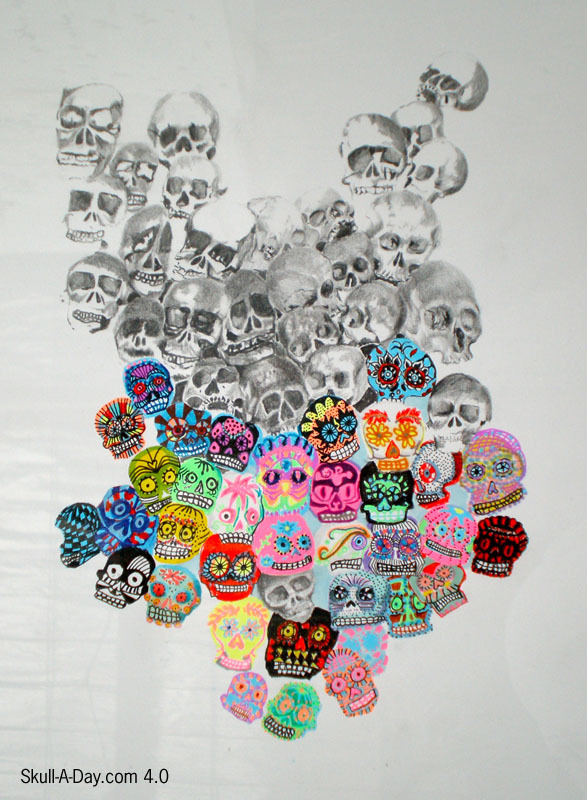 This is due to the use of anatomical skulls to sugar skulls. 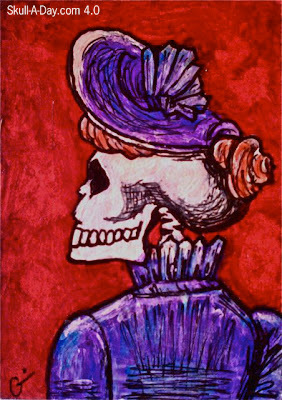 That level of detail in the sugar skulls, is hard to achieve with water colors. You can see similar details in the last one. I love the intensity mixed with the softness. To be entered in today's drawing to win a button just leave a comment below stating: How do you make your skull bright or dark? 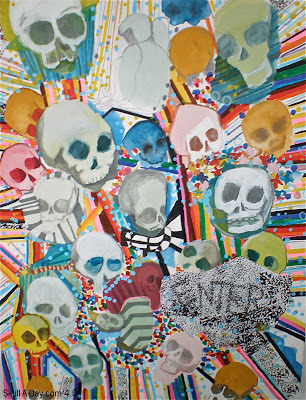 To get the countdown started with only 10 days left to Skull Appreciation Day a collection of Richmond, VA artists. 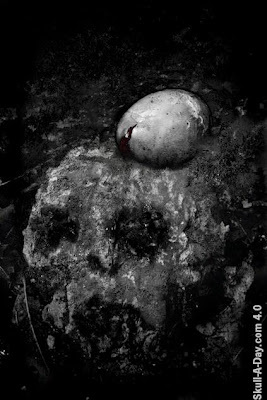 Finally, from Randy Toy who wrote: “Thought about you when I ran across this skull doodle I made on my ipod awhile back. With Richmond, VA holding the honor of being the birthplace of Skull-A-Day it is no wonder we received a large number of items from Richmond, VA based artists. Thank you all for submitting your work and hopefully you will have time to participate in some of the local festivities there. To be entered in the drawing just leave a comment below stating: What is your best name for a skull city? 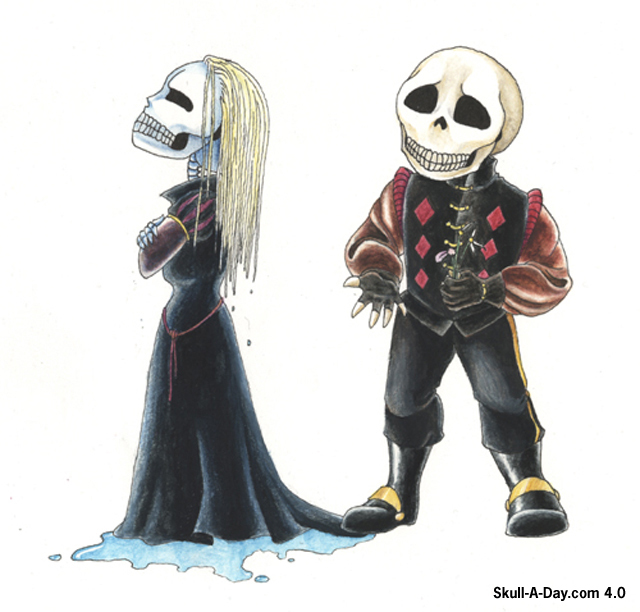 Sorry Skull, Ireland is already taken. 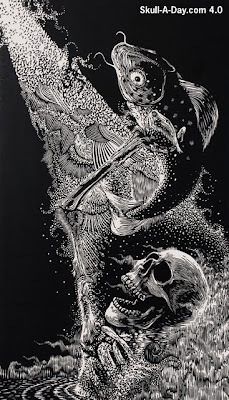 Ramon Rodrigues is back again with another fantastic woodcut skull. His other works are here and here, and today his work rises to the top with a scaly fish friend. The amount of detail work that goes into woodcut art is mind boggling. Ramon does a great job creating such wonderful pieces with a real eye for intricacy. I still don't know what his fascination with fish is, but it's great to see our underwater friends making an appearance here. Thanks as always for the great work, Ramon. To be entered in the drawing just leave a comment below stating: The animal that you think has the strangest skull. My vote is for fish. KimZ from Glen Allen, VA, made this "using a sharpie marker and just dots to create a skull image". 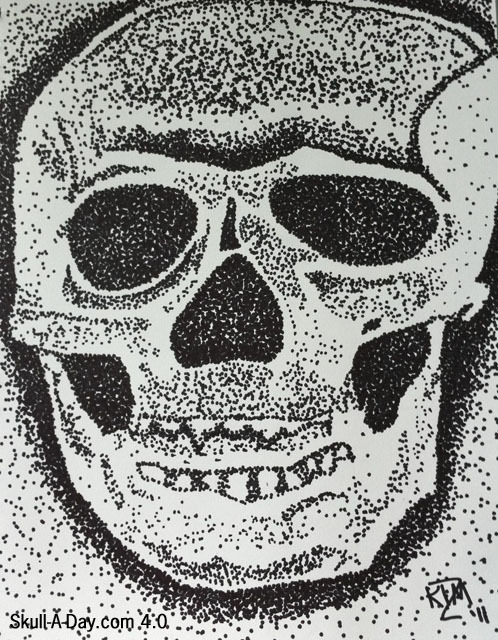 I like the use of pointillism to create this skull. I know that takes a long time to do. Pointillism always makes me think of sand painting. The use of small dots to create an image, is similar to the use of small grains of sand to create an image. Pointillism was developed by Georges Seurat, branching from Impressionism. Sandpainting is used by many people including, Native Americans, Tibetian monks, Indians, Latin Americans, and Austrailian Aborigines, to create different images inspired by their heritage. Sand painting is commonly used in Mexico during Dia de los Muertos to create images of skeletons. Since the celebration is three days long, this is a good use of the temporary art form of sand painting. Impressionism, is long term with the use of paint, instead of sand. Both are equally beautiful art forms, in their own ways. To be entered in today's drawing to win a button just leave a comment below stating: What is your favorite art form? Feel free to knock on today’s skulls. Thank you all for submitting another round to the ever growing collection of simulacra. Week 51? You know what that means? It is less than two weeks before Skull Appreciation Day. 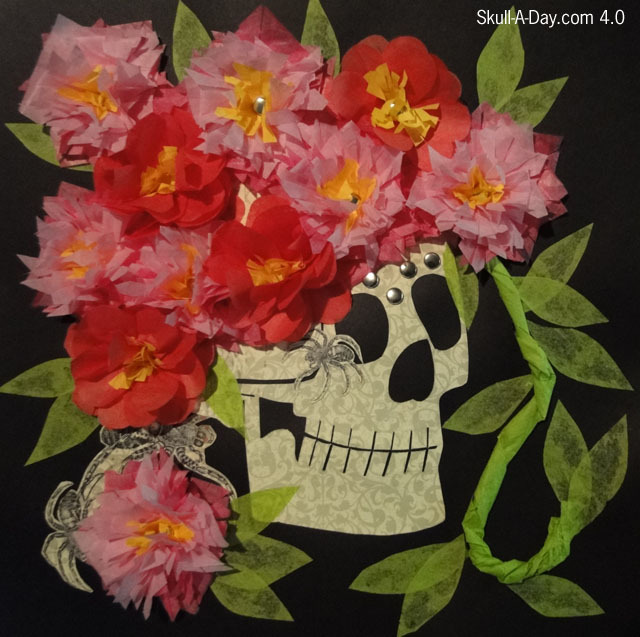 Make your plans now to join Skull-A-Day on their home turf in Richmond, VA (details here) or create your own celebration and share your plans with us. To be entered in the drawing just leave a comment below stating: What would you give a skull for an anniversary present? Stained glass is one of my favorite artforms, and today's skulls are excellent pieces of work. David Kennedy has submitted these great pieces to brighten up our weekend. The skull and roses are beautiful traditional stained glass works, but I really like the new school "Hip Hop" piece. It really looks 3 dimensional with the darker glass making the letters pop out. 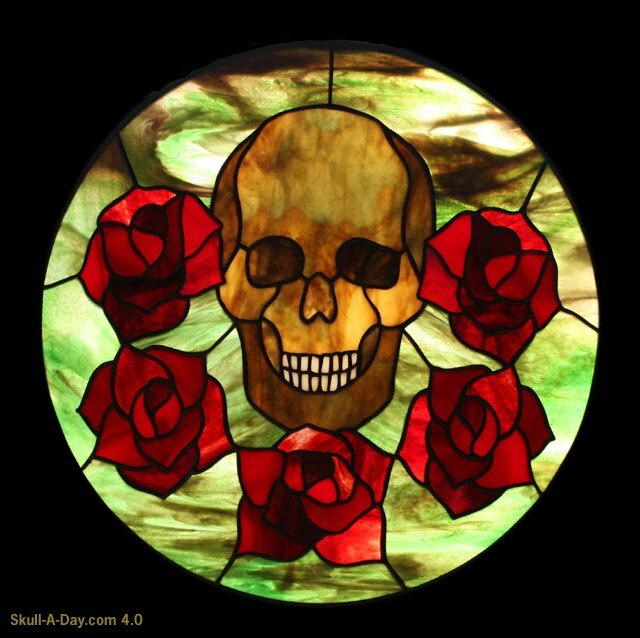 Be sure to check out David's site for even more great stained glass works. To be entered in the drawing just leave a comment below stating: What image you would include with your own stained glass skull. I'd make sure to put a square and compass on mine. Me: Would you like to see a pair of skulls today? I like the beach wood a lot, it fits so well with the surrounding almost as if it had been there for many years fading away. Speaking of fading... in the years since, the last time I tried to carve a nice piece of wood I slipped and was left with a nice scar on my thumb. It is amusing for me to see a piece of wood carved into a thumb drive. Thank you both for taking the time to submit your work for us to share. To be entered in the drawing just leave a comment below stating: Would a skull have a favorite type of wood? 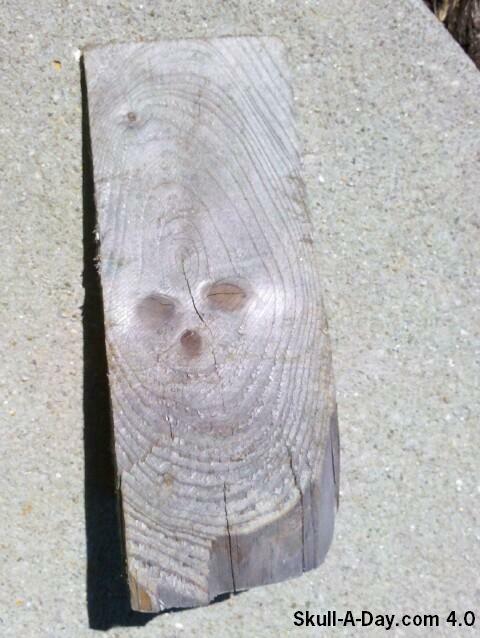 Maybe punk wood? Of course the etched Skull is one of my top favorites of the 1.0 year. After seeing this and other glass etchings it led me down the road to joining others in this craft. My preferred method of etching is to use a stencil because I fall well shy of the Skull Master's level skull creativity. I am still impressed to this day when I see how Noah "painted" the etching cream to produce this negative space skull. 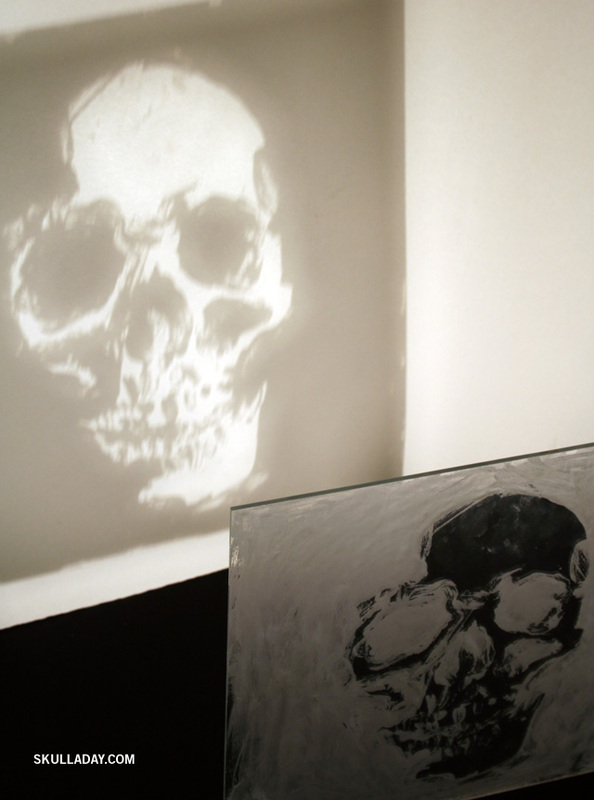 Light cast though creates the illuminated face that lights up a room with it's deadly glow. Thanks (again and again) for the inspiration, Noah! p.s.- You can still get your own official Skull-A-Day etched pint glass, or other custom glasses at my store. Thanks to all of you who have already purchased your own! And longtime fan Denis got this tattoo from Mikio based on a custom skull I drew in his copy of Skulls when we met in Los Angeles. They've joined the elite ranks of fellow Skull-A-Day tattooed folks: GlobGlob (who also used the Skullphabet for a tattoo), Katrina (who had a tattoo designed for her by Skull-A-Day fans), Danny (who got the Rorschach Skull), Tammie (who got my Acorn Skull), Drew (who also used the Skullphabet for a tattoo), and of course myself. Any other Skull-A-Day tattoos out there I don't know about? Today's skull was made as a simple collage example for the craft portion of our Skull Appreciation Day festivities on Saturday, June 4th, 2011. If you would like to learn how I made this, come join us in Richmond, VA at Gallery 5. The craft portion from 12pm-4pm is free. Like I mentioned above, this is a simple form of collage. I know it looks hard, but it wasn't. The flowers are made with tissue paper and small brads. The leaves and vine are also tissue paper. I used a sheet of Halloween vintage inspired scrap book paper for the skull and spiders. 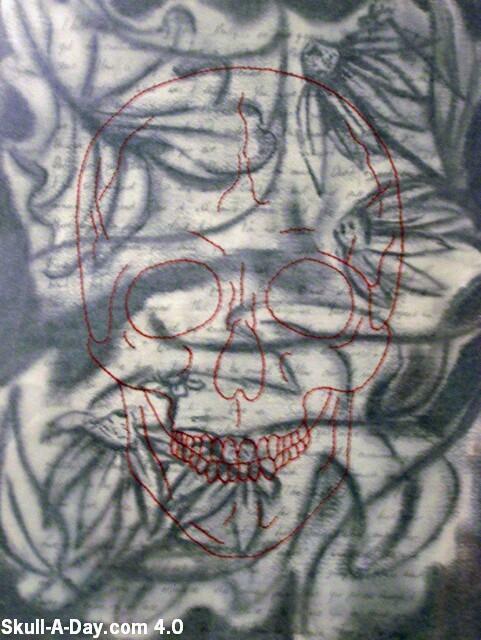 If you look really closely at the skull, you should be able to see skulls and bats in the design of the paper. The spiders were corner designs on the paper. I thought they worked well with the flowers, leaves and vine, since in nature, they coexist. Everything, but the flowers, was attached with Tacky Glue. I prefer this kind of glue because it's thick, but spreads well, dries quickly and isn't messy like regular glues are. This is a good project for recycling old newspapers, junk mail, magazines and telephone books. We recently printed up a bunch of posters for the first annual international Skull Appreciation Day event in Richmond, Virginia on the backs of recycled brown grocery bags to put up around town. The response was so positive that we decided to do a small run of archival prints for sale! This two-color screenprinted poster is 6.125" x 17.5" (15.55 cm x 44.45 cm) on recycled PCF acid-free 100# cover stock. It is signed, numbered, and limited to only 100 pieces. Even if you can't celebrate with us in person you can still show your Skull Appreciation Day spirit with one of these posters for only $10. 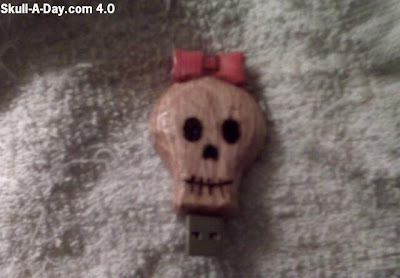 Get it at the Skull-A-Day store HERE. And don't forget we have Skull Appreciation Day logo shirts and buttons available in the store as well. 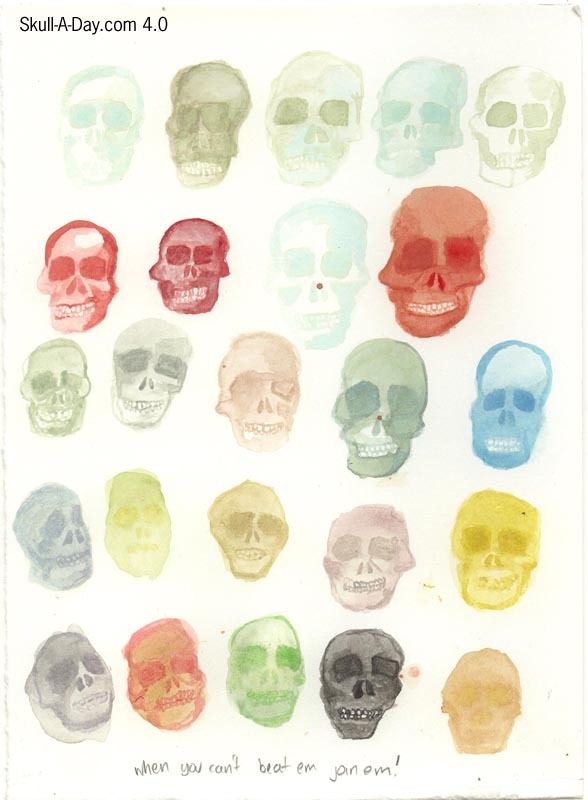 Georgie Mullens submitted two of her works from her participation in a "Skull of the Month ACEO Club"
She explains about these pieces, "As for ACEOs, if you don't know, they are original art trading cards bought and sold all over the world. The only rule is they must be2.5" x 3.5". It's become a popular hobby and also a cool way for people to build an art collection inexpensively. 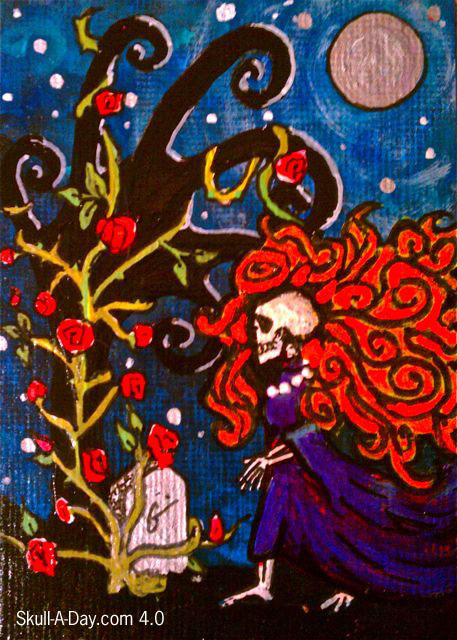 Included are a couple of my skull ACEOs. I paint everyday and not even I know what's going to turn up next. So this subscription thing is going to be a blast for me! The amount of detail in these small painting is amazing. When you are working with a small amount of space, you have to really think about what details to include. The top one is reminiscent of a Victorian lady. At one time in history, the color purple was used for only royalty. This was because the dye needed to achieve purple, was expensive, so only wealthy people could afford fabric dyed purple. By the Victorian time, richly colored fabrics were easier to acquire, though still normally seen on wealthy people. Black was standard, as the dirt of bustling cities was less noticeable, so the garments were cleaned less. Black is sort of standard for most of us here at Skull-A-Day...but you all probably already knew that. The second painting draws me into this imaginary words. I wonder why she taking a stroll through the graveyard at night. Perhaps she is heading back to her grave after an evening of luring unsuspecting drivers to their doom. You know, so she has some new company in the grave yard. I love that her hair and gown blow wildly in the wind, as if she has indeed been up to no good. The roses to me, are symbols of a dark beauty. The flowers are soft and sweet smelling, but their stems and branches they grow from are thorny and dangerous. You must handle them delicately, or you will get injured. Regardless of the suspected danger of this red haired lady, I would like to stroll with her. To be entered in today's drawing to win a button just leave a comment below stating: Where in the past, might you travel with a skull?